LG's trio of new Bluetooth speakers come with the promise of great sound, with party-centric features and the ability to withstand a splash or two. But are they the best value for your money? While LG is mostly known for its televisions in India, it does have a vast portfolio of consumer devices. One such product line that the company is trying to make a name for itself in is the audio space. 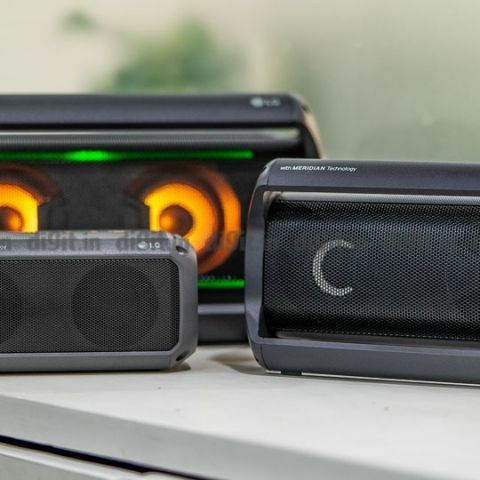 The company has just launched a trio of Bluetooth speakers in the XBoom Go series, the PK7, PK5 and the PK3. LG sent the three speakers over for us to try out and after spending three extensive weeks testing each of the speakers out, we have a few things to say that may help you decide whether to spend your money on them or not. Of the three speakers in the LG XBoom Go series, the PK7 is the largest while the PK3 the smallest. All three speakers utilise a rectangular form factor, with the largest of the three also having a sturdy frame around the speaker. 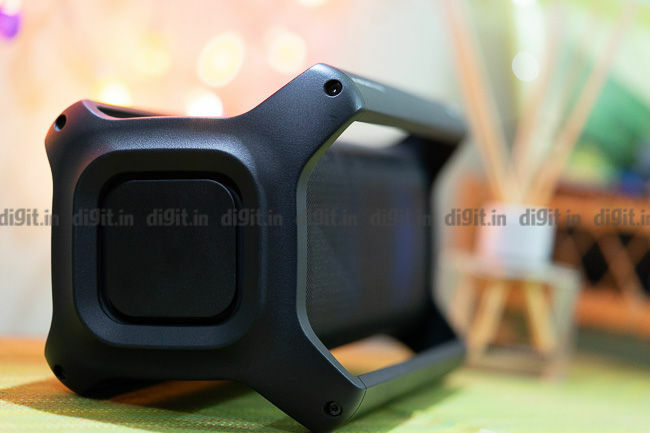 This frame acts not only as a prop for keeping the speaker upright but also as an easy way of lugging the thing around. Unfortunately, instead of being a single solid piece of ABS plastic, the frame is actually two pieces screwed together. A joint with this kind of weight makes us a little worried, but its unlikely you’re going to be carrying the PK7 around in your hands. On the inside, you’ll find two tweeters along with a set of RGB LEDs that light up and bounce to the music. The PK5 does have the frame for easy portability, but it is significantly smaller and has the same RGB LEDs for a nice light show. The PK3 is the smallest of the three and has neither the frame not the LEDs. There are some nice things in common between all three speakers though. For starters, all three are water resistant. The PK7 and PK5 carry an IPX5 rating while the smallest of the three, the PK3 is IPX7 rated. The charging ports are placed at the back and the cover keeping them safe has a three-layer rubber seal to really keep the water out. 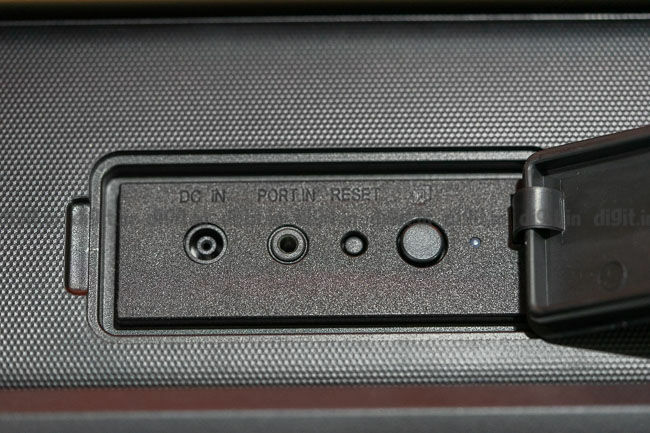 In fact, this particular reviewer once cracked a nail trying to open the cover in order to charge the speaker. That is how tight the seal is. 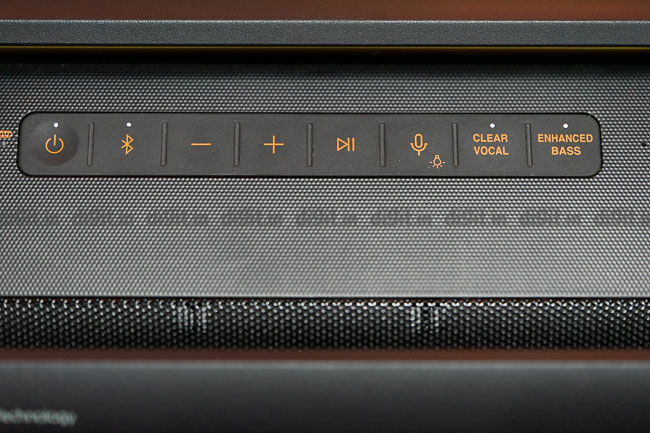 All three speakers have the control buttons laid out on the top and are essentially a rubber strip running across the top panel. The LG XBoom Go PK7 features two tweeters and two passive radiators for a total output of 40Watts when the speaker is plugged into power and 30Watts when it's running off the internal battery. The PK5 and PK3 come with a pair of passive radiators only, for a total output of 20Watts and 16Watts respectively. We tested all three speakers running on battery power with music playing over Bluetooth., We used a Samsung Galaxy Note 9 to stream music in AptX HD since all three speakers support the format. Our test playlist consisted of a healthy mix of Rock, Industrial Rock, Jazz, Psy-trance, Hip-Hop and some pop music thrown in. Music files came from mixed sources which include Amazon Prime Music, FLAC files and a mixed bag of mp3 files. The largest of the three speakers is naturally the loudest and pumps out the most amount of bass. Across the range of music we played, the one thing that is obvious is that the speaker can get really loud. The result is that the PK7 disqualifies itself as an audiophile’s choice of Bluetooth speaker. In tracks that are particularly bass-heavy, such as Rutten by Skream and Nobody Speak by RTJ you hear the bass take over the room. If you take a few steps back from the speaker, the sound fills the room and you start to hear the notes that otherwise sounded like they’d been drowned. This is a party speaker and needs to be played loud. If you’re using an Android smartphone, you’ll have the luxury of being able to tweak the sound to suit your needs. While you will enjoy playing party tunes on this speaker, it is not something that will enjoy listening to Jazz or classical music on. 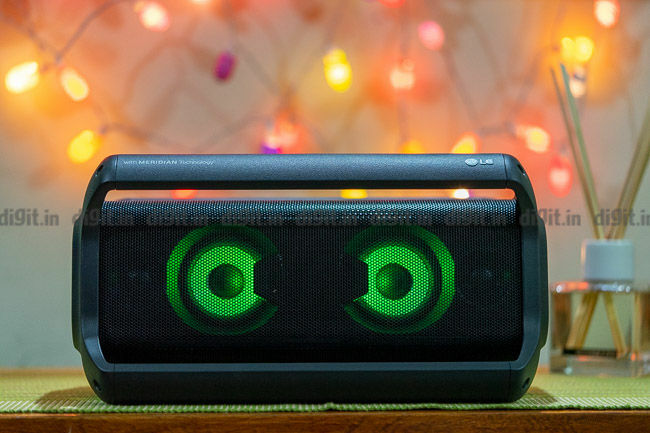 The smaller PK5 speaker has a more balanced sound, and in turn, it trades the overall loudness. While not large enough to be a party worthy speaker, this is a good speaker for most rooms with a size of 160 square feet or less. Starting off again with the same playlist, we hear the bass be less of a dominating force, letting the mids make their mark. Eminem and Rihanna’s collaboration on Love the Way You Lie sounds lovely, with Rhianna's high notes coming forward beautiful and strong. Skream’s Rutten, a track that’s all bass, sounds flat due to the speaker’s lowered bass response. For those who need a more balanced speaker, the PK5 is a more suitable option. The smallest of the three speakers, the PK3 comes across as a somewhat underpowered speaker. The passive radiators are not able to maintain clarity once the volume is raised above 60 percent, with shrill highs and flat bass. While it may not be the best choice for easy music listening, we did find it surprisingly decent for pairing with a laptop and watching movies. The speaker is small enough to sit in front of th laptop, kind of like a soundbar would on a TV. Dialogues sound surprisingly clear for most sequences, except when there are loud scenes with explosions or gunfire. This is where the sound gets really muddled, but for most TV shows and movies, this speaker should suffice. However, we definitely do not recommend this for bass heavy music. LG claims that the XBoom Go PK7 has a battery life of 22 hours, while the PK5 and PK 3 can run up to 18 and 12 hours respectively. The PK5 and PK3 charge through a UBS Type-C port on the back, while the PK7 has a standard adapter-type port. Obviously, the larger speaker has a massive battery and hence, it requires a laptop style charger to top up the battery fast. While this is a good thing for most scenarios, what this also means is that you wont be able to charge this speaker using a power bank if you ever found yourself outdoors and out of juice. The smaller speakers take about four hours each to charge from 0 to 100 while the larger PK7 takes about 3. In terms of how long they last, we got varying mileage depending on the volume at which we played the music, whether we used the clear vocals and enhanced bass features etc. On an average, the PK7 lasted about 19 hours in our use while the PK5 ran for 14 hours and the smallest of the three, the PK3 clocked 10 hours. Whatever said and done, the numbers did impress us. The three speakers in LG’s newest XBoom Go lineup, the XBoom Go PK7, PK5 and the PK3 cost Rs 22,990, Rs 14,990 and Rs 10,990 respectively. While the speakers do manage to do certain things very well, like the PK7 is great for parties while the PK5 is ideal for small rooms and easy listening, all three have viable alternatives in the market for the price. For example, the Sony XB-41 (Review) is slightly cheaper than the PK7, and sounds just as good if not better. Plus, it's smaller, has all the bells and whistles in addition to an IP67 rating. Similarly for the PK5 which competes directly with the ever-popular UE Boom. The LG XBoom Go speakers are not bad, and would even make a great present for occasions like Valentine's Day or birthday gifts. However, if you are absolutely price conscious, you do have cheaper options with the same levels of performance.